As you know Family Friendly Gaming has been a long time cheerleader of Majesco Entertainment. Their Cooking Mama, and Zumba games are awesome. I hoped the same could be said for Hello Kitty and Sanrio Friends 3D Racing on the Nintendo 3DS. I am heart broken that Hello Kitty and Sanrio Friends 3D Racing is not a good game. Especially not at the thirty dollar price tag. I paid twenty to purchase Hello Hello Kitty and Sanrio Friends 3D Racing is not even worth the twenty dollars I paid for it. I beat this game in under one hour. That was racing and winning all four circuits which have four races apiece. The grand total of sixteen races are in this hand held racing video game. 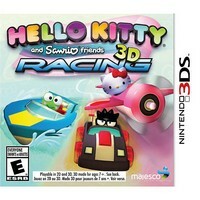 Hello Kitty and Sanrio Friends 3D Racing does contain challenges (called Adventures). They are things like race a lap and collect ten items. Or race a couple of laps and collect ninety-nine items. Or go through so many gates in one lap of a race. These are tiny and rather pointless after racing the circuits. Hello Kitty and Sanrio Friends 3D Racing is a port from the iOS - which is fine. In fact we encourage a lot of ports from the iOS. This game should be sold for no more than ten dollars. Which some might argue is too high of a price to pay. The violence comes from the weapons. We spin out other racers by having them hit cones we leave, or things we shoot at them that looked like cakes. The graphics are not that great for the 3DS. This is an area that should have been upgraded and not just ported. The sounds are okay, but they lag behind the visuals. Which is a very noticeable glitch. The different characters, and vehicles are cool in Hello Kitty and Sanrio Friends 3D Racing. I could never tell which car, boat, or plane was better since there was no stats shown.